If you picked up Madden NFL alternative Backbreaker and found that the football game had some major issues, you might want to go back and give it a second chance. 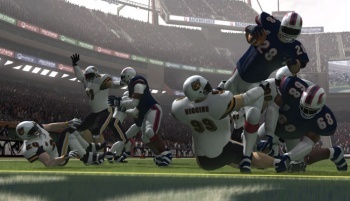 Back in June, 505 Games released Backbreaker, an action-packed take on the football game that placed gamers right down over the shoulder of their virtual athlete of choice as opposed to the eye-in-the-sky camera of Madden. In other words, it was football a la Gears of War rather than an RTS. Unfortunately, while the core concept was fantastic, the game itself had some serious problems that made it feel way less fun than it ought to have felt. There was very little control over the replay camera, the play selection felt limited, the AI was prone to penalties and getting in your way, and there were plenty of mistakes in the actual rules of football: Do you know the difference between a missed reception and a fumble? The game didn't. Thankfully, developer Natural Motion hasn't just been squatting on the sidelines this whole time. Earlier this week, the developer released a major patch for the game it called the "Greathouse" update. What does the Greathouse update do, you ask? Well, you know everything that I mentioned up there that was kind of less than awesome? Yeah, it fixes all of that stuff. * Brand new replay system with the addition of seven fully functional cameras, including free flight mode and a cinematic 'ball-lock' option. * More than 100 new plays added, including an additional nine formations. * Improved Quarterback camera view and passing game. * A user-catch system, giving the player a much greater level of control over the on-field action. * Interception control, the user is now given full control over interception attempts when controlling a defensive player. * Comprehensive review of the penalty rulings following an analysis of reported errors. I spent some time with the new, updated game last night, because I'd always felt that Backbreaker had a ton of really great potential at its core and I wanted to see if Natural Motion could draw that potential out and deliver on the game's promise. Yes, yes it can. Backbreaker works really, really well now. The passing game is much less finicky to wrestle with and the defense's magical interception skills have been tuned down to something more realistic. My teammates weren't picking up any more idiotic penalties like roughing the kicker, a dropped pass was a dropped pass, and the game's playbook actually makes it much easier to understand the play you're calling on defense. The game was genuinely fun before, but the fun kept on getting broken up by moments of frustration due to genuine errors in the game. Now, if those errors do happen (and I can't say they'll never happen under any circumstance), they're very few and far between. Backbreaker still has issues. It still looks like you're fielding a team of Judge Dredd cyborg clones, and as far as I can tell, there's still absolutely no point in having depth charts or second-string players because your team never gets tired or injured. But the game has a chance to let its truly excellent core shine now, and it's good to see a title finally living up to its potential. It's a genuine shame that the game didn't ship in this state, because clearly the developers were able to fix the glaring issues. Better late than never, I suppose, and if you put down Backbreaker a while back, you just might want to pick it up again. And yes, the tackles are still bone-crunchingly brutal. That's the best part.